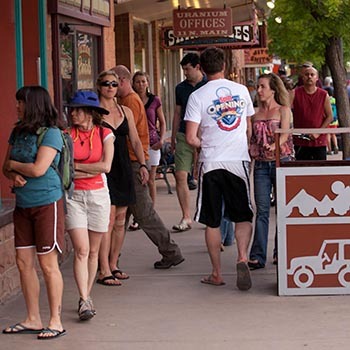 The little town of Moab is full of great and unique shopping opportunities with all of the locally owned shops we have to offer. From delightful gift stores to all natural grocers, the possibilities are endless! Right in the center of downtown Moab, many fun gift shops are available for your viewing. Starting from 100 South and traveling down two blocks to 100 North, these locally owned stores line both sides of the street - each shop different from the one before. Parking is available along the streets in front of the gift shops; however, it can be difficult to find a spot when town is hopping. Heading west on Center Street, you can turn right at Sew Moab into a free parking area - perfect for those wanting to take a walk around the gift shop and restaurant area. Right in the heart of Moab is modern art shop truly created by the locals. With pieces from residents all over the Moab area, it’s easy to find a little piece of Moab to take home with you. Looking for a unique Moab shirt that visually describes your awesome Moab vacation? The T-shirt shop is just the place! Create your own unique and one-of-a-kind shirt with hundred of styles and designs to choose from. Hand crafted art is at every turn in this exquisite shop. Native American jewelry and pottery, as well as southwestern decor and gifts are available to any budget! Stop in today to pick up a piece of Utah’s history. This bookstore is more than just a store of books; it’s a store of history and adventure! 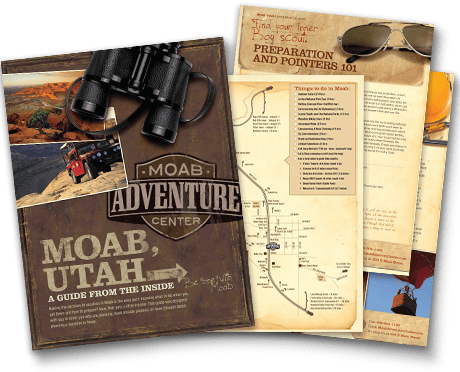 While literature is of course a large part of the inventory, there are also many trinkets and artifacts that show visitors what Moab was like back before it was the bustling tourism town it is today. This trendy chic boutique carries elegant and unique clothing and shoes at an affordable price. If you’re enjoying a day out with the girls, this is a must-stop shop! Step inside this charming shop and you’ll find yourself surrounded by darling antique-inspired home decor. These rustic pieces are sure to spruce up any room!